If you own or operate other businesses that you wish to include as a member, you must submit a separate application and pay separate dues for that company. 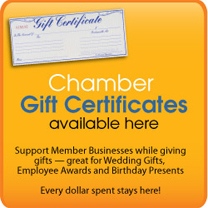 Call the Chamber to learn about multi-business discounts. After submitting your membership application, please send a check for your dues to : Marengo-Union Chamber of Commerce 116 S. State Street Marengo, IL 60152 Please include a business card and any informational materials for our files. Thank you for choosing the Marengo-Union Chamber.